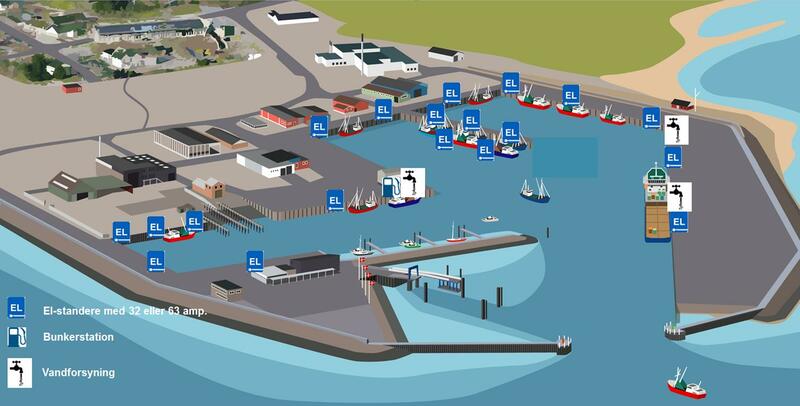 Electricity, fuel and fresh water are available at the Port of Romo in accordance with the diagram below. Cards are to be used when using all three facilities. The cards are available upon request at the Port Office. Remember to bring relevant information for invoicing and a mail address for the mailing of the invoice. Outside of opening hours, the cards can be obtained from the harbour guard. Fuel is invoiced by Hanstholm Havns Olieforsyning. For prices, please see the Terms of Business & Tariffs or ring and inquire at the Port Office.